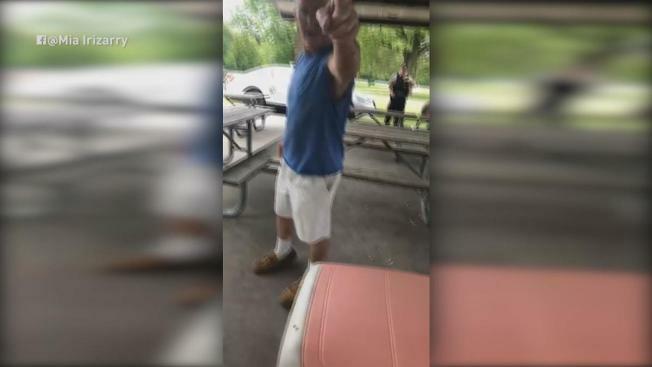 The woman seen in a viral video being harassed for wearing a Puerto Rico shirt at a Cook County forest preserve spoke publicly for the first time Friday since the man involved in the incident was charged with a felony hate crime and the officer at the scene resigned. Mia Irizarry said the latest developments in the fallout from her viral footage left her "severely disappointed," but at the same time brought her "indescribable joy." She was disappointed, she said, after learning of the officer's resignation, saying, "I will never get to hear his explanation." But she noted she was happy that her video prompted such a reaction. "This man will never be in a position to protect a life yet turn away again," she said. "I have done my job," she added. Little had been heard from Irizarry in the weeks following the incident, which took place as the vet tech tried to have a 24th birthday celebration in Caldwell Woods. Irizarry's Facebook video documenting her encounter has taken over social media in recent days, despite being posted nearly one month ago. She said she filed a complaint on June 21, but didn't know her complaint was received until her story went viral again. "I found out all my information the same way you guys did, through [the Forest Preserves'] Twitter," she said. A woman's video of a man berating her shirt choice in Cook County Forest Preserve has gone viral after an officer in the video does nothing to help. Timothy Trybus, the man seen berating Irizarry in the footage, had earlier been charged with misdemeanor assault and misdemeanor disorderly conduct. Those charges were upgraded to two counts of felony hate crime after the Cook County State’s Attorney’s Office reviewed the case. Trybus was re-arrested Thursday and released on bond Friday. The Cook County Forest Preserve officer seen standing by while Trybus harassed Irizarry in the video resigned, officials said Wednesday evening. "Effective today, Officer Patrick Connor no longer serves in the police department of the Forest Preserves of Cook County," the forest preserve tweeted. "He resigned late today. But that isn’t where our work ends." "My life had such little value to him," Irizarry said Friday. Before the filming began, Irizarry said her encounter started when she arrived at the park and asked Trybus and others to leave the area because she had rented the space for a party. Trybus questioned her shirt, asking if it was the Texas flag, and at one point jumped on a table, she said. "What made me start recording was the moment that he stepped on the table and showed his aggression," she said. "I haven’t thought about what would happen if I hadn’t recorded, although I’m pretty sure it would not have ended well for my safety," she said. The video shows Irizarry asking Connor for help, but the officer does not appear to stop Trybus, who continues his rant and gets increasingly closer to Irizarry in the space she said she had rented that afternoon. “Officer, I feel highly uncomfortable; can you please grab him?” she is heard saying on the footage. Connor is then seen turning around and walking back toward his car. “Why is she wearing that sh--?” Trybus said. Trybus questions if Irizarry is a citizen of the U.S. and continues to shout at Irizarry as she pleads with the officer to remove the man from the space, footage shows. Puerto Rico is a U.S. territory and residents on the island are American citizens. "It was extremely surreal to think that someone who’s job basically on them - protect and serve - to completely walk away, not even ignore at that point, but to completely walk away, it’s still pretty surreal," she said. Eventually, Irizarry's cousins arrived at the scene and get involved. Other officers arrive several minutes later and one eventually takes down Irizarry’s information and her account of what happened. Trybus, who authorities said was intoxicated, was arrested at the scene. "I am greatly surprised, shocked, I’ve never personally had an encounter with racism to this degree so it was definitely an eye opener," Irizarry said. Though the footage had already been seen over a million times after it was first posted in early June, new postings of the video prompted responses from the forest preserve and even the governor of Puerto Rico. Forest Preserves officials said the officer involved in the incident had been with the department for 10 years, and did call for assistance on his radio. Still, they stated the officer's actions were not part of procedure. "The officer should have stepped in and he should have done something," Forest Preserves Chief of Police Kelvin Pope said during a news conference Tuesday afternoon. "And that's the reason we’re here today, because he did not." They noted that they apologized to Irizarry and refunded her money. “All people are welcome in the Forest Preserves of Cook County and no one should feel unsafe while visiting our preserves,” their tweet read. A Latino man said he was working a landscaping job with his mother in San Bernardino County when a white woman approached them and began berating her, telling Guzman's mom to "go back to Mexico." Robert Kovacik reports for NBC4 News at 11 p.m. on June 25, 2018. Others said more needs to be done in wake of the incident. "From my understanding there have been several apologies issued but the thing is that apologies are only the beginning," Cristina Pacione-Zayas, co-chair of the Puerto Rican Agenda, said Friday. "We want meaningful, measurable and palpable change." The group, who stood by Irizarry as she gave her statement to the press, called for audits of the Cook County Forest Preserves and policy change. "We nee to know what exactly are you going to put in place and when exactly are you going to do it," Pacione-Zayas said. Irizarry, who said she ultimately managed to enjoy a barbecue at the park for her birthday hours later, said she plans to continue visiting the forest preserve, despite her experience. "One officer is not the mark of all of them and I am very aware of that," she said.